As I sat down enjoying a cigar and beverage late the other evening, a stranger sat down and offered to buy my a drink. Nothing creepy, they just recognized me and wanted to chat a bit. That was cool. I am always up for some cigar talk as well as a free beverage. I then offered my new found friend a cigar. He did not have any “tools” to light it up, so I handed over my personal cutter and lighter. 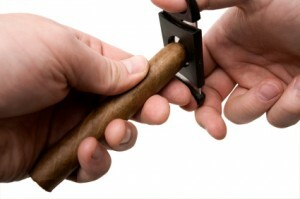 The person said they didn’t need the cutter – He then proceeded to bite off the end of the cigar. For starters, it was a good stick. Secondly, this act was the swan song to his telling me what a “cigar aficionado” he was. There a a million posts on how to pick out a good cigar cutter and use it properly. Don’t take off the entire cap of the cigar (check out the example in that cool professional photo I found). That is pretty much it. Use a cutter and remember that you can always cut more off if you decide you need to.